For years, Subaru offered an off-road package on its compact car, the Impreza, for people who wanted a vehicle that has increased interior volume and is suitable for the wild outdoors without having to buy a truck-based SUV. Eventually, in 2016, Subaru decided to spin it off as a standalone nameplate. 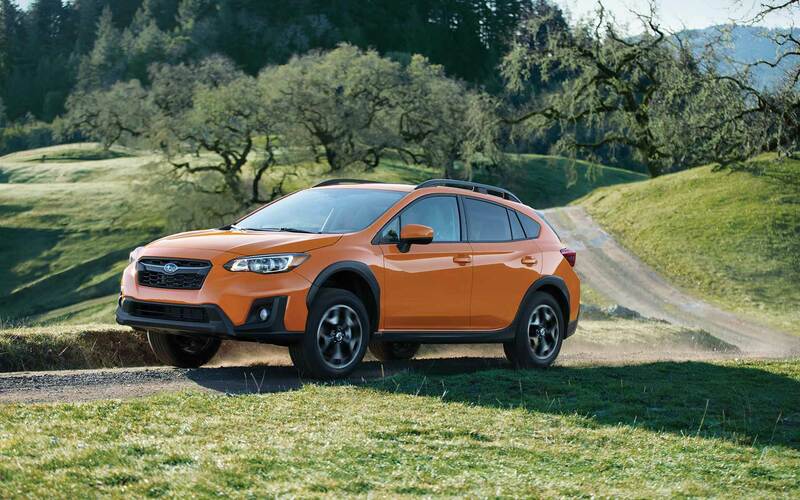 Based on the hatchback version of the Impreza, the Crosstrek is now in its third model year with the 2018 edition, which is redesigned to fall in line with the fifth-generation Impreza. Three trims-a base-level model, the Premium, and the Limited-are available. Regarding exterior features, the 2018 Subaru Crosstrek starts off with multi-reflector headlights, a rear spoiler, daytime running lights integrated into the headlights for increased conspicuity, foldable power side mirrors, and black-finished raised roof rails. You can upgrade to the Premium or Limited to also get fog lights for more penetrating illumination when needed, as well as automatic on/off ability to automatically turn on or switch off the headlights in response to amount of outside lighting. On the Limited, the side mirrors get turn-signal indicators, and the headlights have LED-based steering responsive technology for brighter and more accurate lighting. While the Limited rides on 18-inch alloy wheels, the other two trims get 17-inch ones. 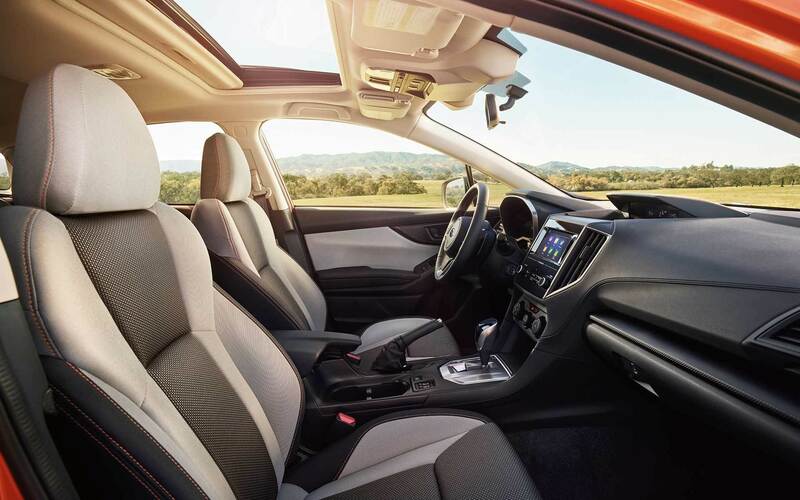 As a small crossover SUV, the 2018 Subaru Crosstrek offers a passenger volume of 100.9 cubic feet. Cargo space-which is measured from the rear bench-style seat to the liftgate-is measured at 20.8 cubic feet. You do have the option, though, of folding down the rear seat to expand it to 55.3 cubic feet. Front seating consists of a 6-way manually adjustable driver's seat and a 4-way manually adjustable passenger seat. 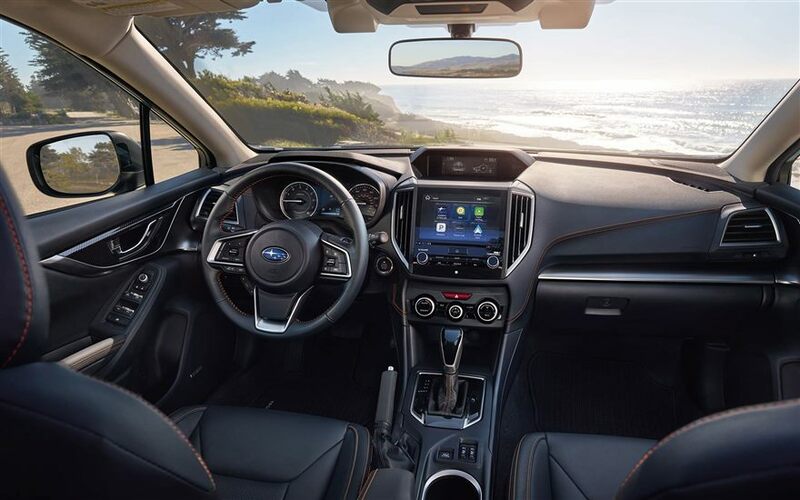 If you go with the Premium, however, Subaru adds front-seat heating ability, orange stitching on the seats and steering wheel, and leather wrapping on the steering wheel. Exclusive to the Limited are orange stitching-bearing leather upholstery and a 6-way power-adjustable driver's seat. Other standard interior features include a multi-function display, keyless start, electronic cruise control, four-speaker AM/FM audio, Bluetooth® wireless technology for hands-free phone operation and audio streaming, Android Auto™ and Apple CarPlay™ for executing infotainment functions with your smartphone, a USB port and an auxiliary audio jack for connecting mobile devices, and STARLINK™ infotainment integration supported by a 6.5-inch high-resolution LCD touchscreen. The Premium has six-speaker audio instead of four-speaker. And the Limited stands out with its 6.3-inch color multi-function display, push-button engine start, automatic climate control, an 8-inch LCD touchscreen (in place of the 6.5-inch), a complimentary four-month SiriusXM® satellite radio subscription, a single-disc CD player, voice activation, and dual USB ports (instead of a single USB port). 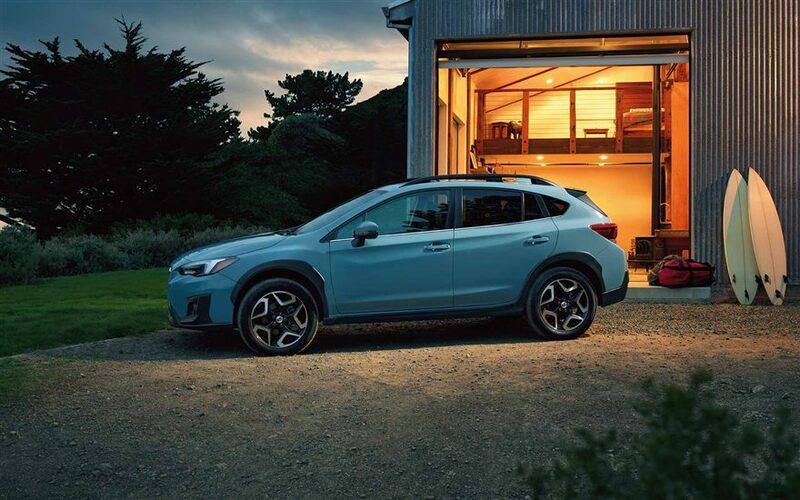 Powering the 2018 Crosstrek is the 2.0-liter SUBARU BOXER®, which is a horizontally opposed 4-cylinder (H4) engine with 152 horsepower and 145 lb-ft of torque. On the base-level and Premium trims, the H4 is glued to a 6-speed manual transmission, with the option of a continuously variable transmission (CVT) for a more convenient and smoother ride; the CVT is standard on the Limited, which also comes with paddle shifters for simulating a manual gearbox. Like other Subaru vehicles, the Crosstrek has standard all-wheel drive, which is aided on the Limited by X-MODE® technology to optimize traction control in the most extreme low-friction conditions. Also present is active torque vectoring to heighten handling and turning ability. A four-wheel independent raised suspension-which consists of a strut-type front suspension and a double-wishbone rear suspension-keeps the undercarriage further away from potentially damaging debris and cushions the driving experience from road imperfections. And the electric power-assisted rack-and-pinion steering provides a turning circle of 35.4 feet. The 2018 Subaru Crosstrek provides a driver's knee airbag, dual front impact airbags, dual side impact airbags, and dual side curtain airbags for restraint and cushioning in the event of a collision. Also standard are electronic vehicle stability control, traction control, a rear-vision camera, an anti-theft system that combines keyless start with engine immobilization, and four-wheel anti-lock disc brakes with electronic brake-force distribution and brake assist and override. On the Premium and Limited trims, Subaru adds a STARLINK™ Safety and Security suite of services that includes automatic collision notification, SOS emergency assistance, roadside assistance, and stolen vehicle recovery. Exclusive to the Limited are hill descent control and blind-spot detection with rear cross-traffic alert. Ready for your next vehicle purchase? Come on over to our Boulder Subaru dealer in Boulder Colorado today to take a test drive. With many a Boulder Subaru dealer in Boulder Colorado-and, by extension, the Denver metro area-we are nevertheless the place to be thanks to our reputation for providing customer service, as well as a robust inventory of vehicles. 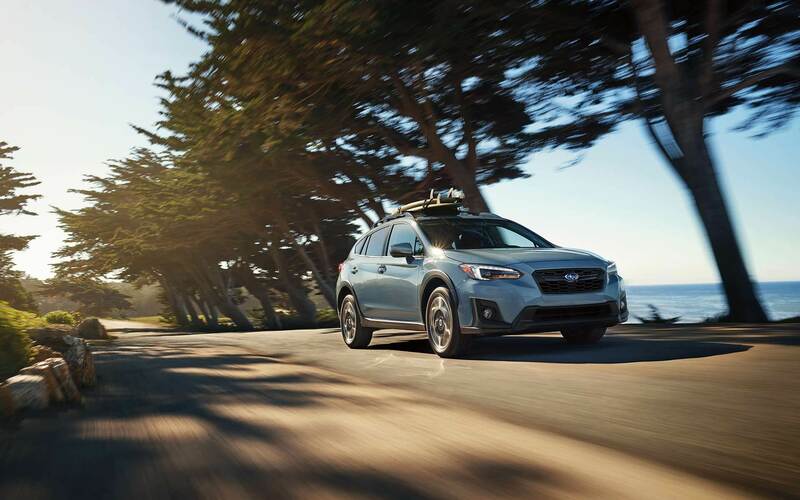 Schedule an appointment at Boulder Subaru dealer to test drive the new ride in Boulder Colorado today. And after your test drive, sit down with one of our sales specialists to choose the vehicle that has your preferred features and options.